Broken sills, chipped door, scratched window frame repairs available in North West London and Nationwide. You don’t need to replace damaged uPVC items anymore. Our man don’t use magic to repair uPVC items in North West London, but damages disappear and repairs are completely invisible. Please call us for free repair estimate to any hard surface damage. 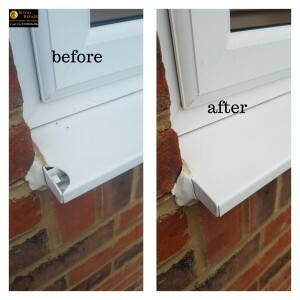 Please have a look below, how we repair uPVC window sill broken corner in North West London.